WOODLAND ANIMALS BABY SHOWER GAMES. If it's time to celebrate a precious baby on his or her way, make sure you have the woodland animals themed baby shower games pack at your special event! Your guests will love the conversation and laughs that come about with these adorable and updated classic party games and activities. And you will love the wise (and often hilarious!) baby advice showered upon the parents to be, as well as guests' baby predictions and warm wishes for the baby. Other games include Baby Shower Bingo, Baby Emoji Game, Mommy or Daddy Game, and What's on Your Phone? These gender neutral baby shower games for boy or girl will help make your event memorable and a big success. Each pack has 6 baby shower games on three 5"x7" game sheets (one game on each side), and there are enough game sheets for 25 baby shower guests. 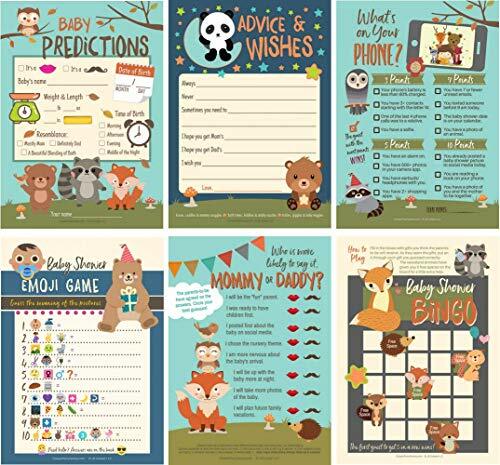 6 BABY SHOWER GAMES and activities for 25 guests included on three (3) 5" x7" game sheets: Baby Predictions Game, Baby Advice and Wishes, Baby Shower Bingo, Baby Emoji Game, Mommy or Daddy Game, and What's on Your Phone? WOODLAND ANIMALS baby shower games add whimsy and sweetness to your shower! FUN BABY SHOWER GAMES are easy to play and will entertain your guests and create lively conversations! YOUR BABY SHOWER GUESTS will enjoy making predictions for the baby and giving warm wishes and advice to the parents! GENDER NEUTRAL baby shower games feature cuddly Woodland Animals and are perfect baby shower games for girl or boy! You receive enough game sheets for 25 guests. If you have any questions about this product by JB Cooper, contact us by completing and submitting the form below. If you are looking for a specif part number, please include it with your message.